Something is missing in this exhibition: it lacks a punchline. The works extend aesthetic and semiotic gestures - we feel that something is being given to us, but ultimately notice the messages are blanks, signs without words. The unattributed triumphs, the non-events, the bleak outlooks and the empty poetry all create expectations which we want to see fulfilled. The promises are seductive, and we find ourselves going along with them - and are led to make our own resolutions. This exhibition almost did not open. Reflecting on its own title, the project came to the brink of collapse an unreasonable number of times in its ten-month development: changes of direction (backwards, as well as sideways), scheduling failures, a commission which resulted in no work being made, answerphones instead of conversations, shipping delays, funding fluctuations, and finally the threat of the gallery losing its premises. Anyone familiar with the ways of the art world would surely sympathise: operational setbacks are not uncommon, and Murphy’s law has long prepared us to expect the worst. But even in the starkest of landscapes, unfinished business would stand out for its autothysic tendencies, and the self-destructive force appears to have been domestic rather than majeure. 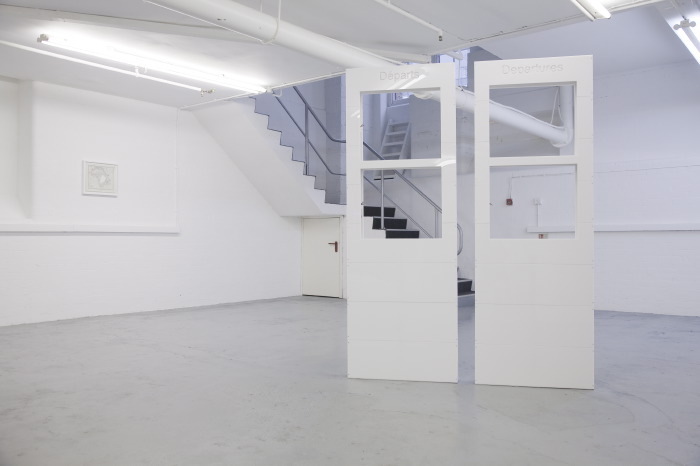 The determined sabotage performed moments before a conclusion becomes apparent – itself the link between the works in the exhibition and the artist’s practices - was allowed to take over the prosaic logistical arrangements, as though dictated by the project’s title. The alleviating factor in this irony is that the carpenter ant’s suicide is essentially an act of altruism. The works in unfinished business set themselves up for failure too. They present unattributed triumphs, non-events, bleak outlooks and empty poetry, filled with expectation and aesthetic and semiotic gestures which suggest a predictable, if not inevitable outcomes and conclusions. But the expected resolutions don’t appear, and the final scenes of the feel-good flicks are sharply edited away. The narratives apparent at fist glance turn out to be only structures, signs without words. Kevin Schmidt’s video work Wild Signals brings together the tradition of landscape painting and commercial pop culture. 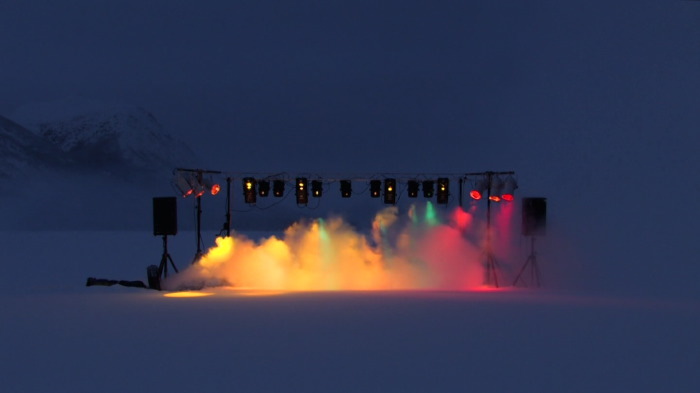 Set on a snow-covered mountain plateau is a rock-concert stage, complete with colourful flashing lights and a fog machine. In early evening darkness, the concert begins, and we hear Schmidt’s own arrangement of the five-note sequence used to communicate with aliens in Steven Spielberg’s 1977 film Close Encounters of the Third Kind. The traditionally sublimated subject matter is injected with an ever more overly spectacular, supernatural (and supposedly extraterrestrial) element, and the mountain landscape is cut apart. The Canadian artist’s work has often used the contemporary commodity to intervene in a landscape: he has created faux mist in a forest at night, and used a landscape photography exhibition to sell his car by showing it in dramatic locations in a way reminiscent of magazine advertising. The conflict of the rock stage in Wild Signals and the harsh but idyllic mountains around it places both of the elements out of context – it is not only the artificial that is on foreign territory. The production of these works involves a pilgrimage. In his Epic Journey, Schmidt installed a one-seat cinema on a dinghy boat, and drove it down Vancouver’s Fraser River, until the batteries failed. Wild Signals is filled with another futility: the extraterrestrials don’t arrive, and the pop-up rock festival attracts no audience. This in itself, however, is not necessarily the substance of failure presented in the work. Instead, the concert questions the constant availability of aesthetic experiences which have allowed it to go ahead without any regard for ticket sales. Through nineteenth-century landscape painting, to pop-culture and Hollywood, the commercialisation of our aesthetic experiences have encouraged the habit of reproducibility, and the mountain views, which we consume more readily in pictures than in reality, have become the primary clichés. British Columbia, Schmidt’s domicile, is often referred to as Hollywood North. Here, everything can be consumed, and everything looks better in Technicolor. 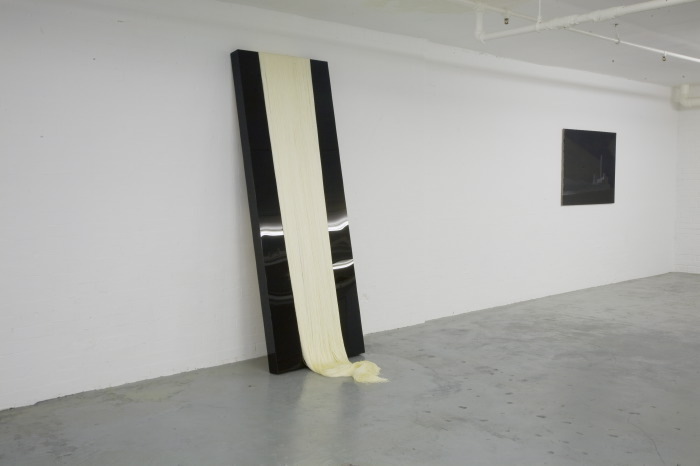 Oslo artist Stian Ådlandsvik has employed sculpture, photography and installation to explore the unexpected connections in social and economic realities. His Laissez-faire unit #2 comprises of information display panels collected from a French airport, and deprived of their utilitarian ability. The panels, placed together as though to form a set of doors, suggest movement and transit: arrivals and departures, beginnings and endings, laughter and tears. This sentiment recalls the opening and closing scenes of the 2003 film Love Actually, in which the narrator declares the airport arrivals hall an environment filled with expectation and, somewhat cringe-inducingly, love. In Ådlandsvik’s sculpture, the feeling is expelled from the cold and colourless surfaces. The gateways don’t necessarily lead anywhere, and the symbol is left to function on its own. What remains is the idea of transit, a crossing to another reality. The territory demarked by an often invisible organisational principle can be in stark contrast to what is on the outside. In Ådlandsvik’s work, crossing these lines is an act of estrangement, and the locations are abstracted to fiction. Ådlandsvik’s work has often looked across national borders, suggesting a series of ‘what if’ scenarios. Norway’s attitude to geographical limits has been a precarious one since the early 1970s, when oil reserves were discovered on the country’s continental shelf. An earlier work explores the possible outcomes of the reversing an infamous diplomatic incident in 1963, which awarded the oil-rich areas to Norway and not to Denmark. Travel Plan continues this thread – connecting the known with the unknown with the comfortable distance of impossibility and fiction. The found map of Africa, dating from 1824 contained an area labelled as ‘contrée tout-a-fait inconnue’ – a country completely unknown – which the artist has separated and placed in another frame, thus removing the unknown from any context. This could be read as an act of nostalgia for an unknown place in which our limitations have not yet been tested, and for borders which are still to be crossed, yet in the two frames, the unexplored also becomes unexplorable, and the expanded possibilities are a mere fabrication. Kama Sokolnicka’s paintings show a post-apocalyptic, desolate world, in which only the outlines of man’s creation remain. 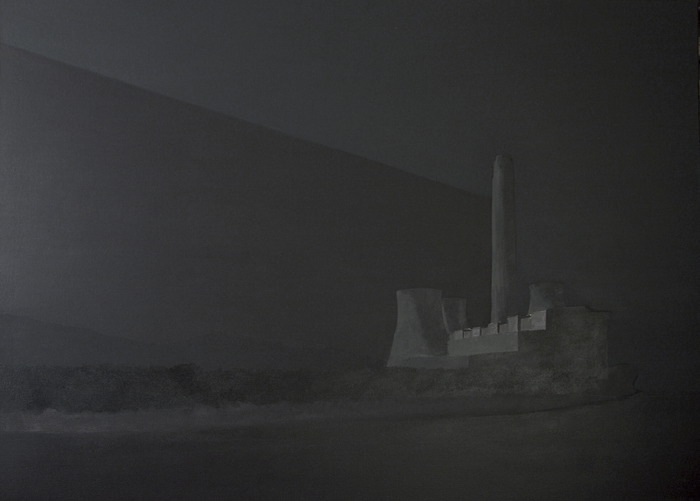 The two presented in unfinished business, are part of A Phantom and a still landscape, a series of nine. Devoid of detail, the industrial buildings appear to be placed in a landscape even more bereft of features. It would be easy to connect the stark buildings and arid landscapes with the history of Communism and its architecture in Sokolnicka’s native Poland – until we understand that the majority of Western Europe’s industrial buildings (the cotton mills of Victorian England, for example) function in a similar way. The ‘pictorial’ exposes its own construction and the aesthetic illusion which permeates our capitalistic cultures. The darkness and muted colour palette employed in the work both make and take away the subject. There is a further irony in the function of the buildings Sokolnicka has chosen – prefabricated and uniform, the power plants do not emit any light themselves, yet there is a certain permeating energy around them, even if they appear to be out of use. Buildings like these, as well as residential dwellings, have often featured in Sokolnicka’s work. Her installation work has explored the functionality of these structures, but her 2D works reveal an indicative sentiment. A 2004 series of drawings Boiler house with living facilities shows her family home – literally a converted boiler house. But while warehouse living is a thriving fashion in East London, the artist returns to the industrial not out of thrill-seeking, but plausibly because of a need to romanticise her own experience and thus to remove it to the realm of an image. 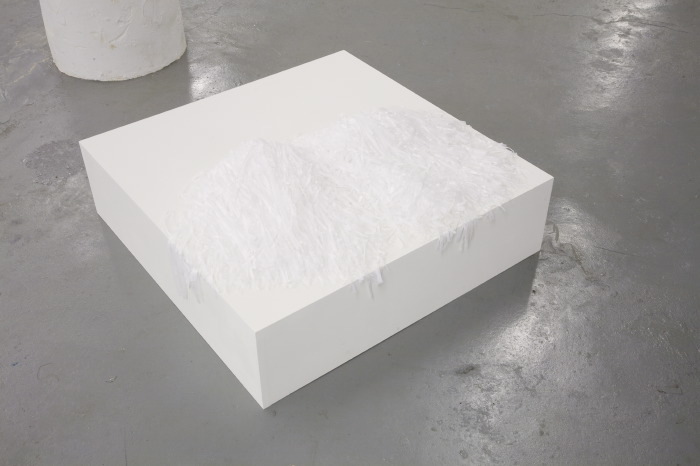 Kiera Blakey’s sculptures take the reductive approach further. Her objects, often made of simple materials like plaster or MDF, appear to be made entirely of lines and shapes akin to those found in a children’s colouring book. Blakey offers the minimum of information necessary to imply a functionality or meaning in her sculptures, leaving the burden of creating the colour, texture and substance between the contours to us. While Triumph and Pom-poms both refer to celebrations and festivities, their almost translucent quality leaves them unattributed. There is nothing to celebrate: the horse race didn’t take place and the cheerleader doesn’t have a team. Instead of joining the fête, Blakey considers the way we construct our experiences and create meaning in everyday images. Looking at her work involves an assumption and an element of guesswork, and the sculptures themselves do not confirm whether the choices we make are correct or not. Pom-poms, for example, could well be a pair of household dusters, Christmas decorations, or conceivably toys. An earlier work, Balls, showing two shapes connected with white ribbon, leaves no clear indication as to its functionality. The matter-of-fact titles employed by Blakey cover the obvious – we know a ball when we see one – and suggest a further consideration of the object’s possibilities. The option for mis- or re-interpretation is palpable in the artist’s work, and her practice exposes the fact that signs and their meanings can be related in a completely arbitrary way not only in language but in the world of objects as well. With this in mind, we are free to start anew, placing the pieces in a different order, and perhaps finding a different cause for celebration altogether. Leo Babsky combines seduction and warmth with inapproachability and coldness. His sculptures often refer to the glamorous aspects of contemporary life - like high-end fashion retailing or sexual fetish - but expose them to be lacking not in finish, but in background. Pyramid Schemes is made of contrasting slick and glossy materials. The surface of the sculpture is an alluring void – black and vast – broken by tactile and soft threads; together, they indicate a combination of resolve and flexibility. This combination appears irresistible, and is further made attractive by the fact that we see our own reflection in the black acrylic. A closer inspection of the work reveals a makeshift construction of untreated wood and duct tape which is at odds with the spotless front. The recurring notion in Babsky’s work is that the disappointment of the low-finish should not be a surprise - the failure is clearly contained in the success. In an earlier work, New York Beverly Hills Chicago, the artist leads us into a similar trap. The black fabric panel embroidered with golden thread and framed behind reflective glass lists an array of city-names, mimicking the displays on the windows of fashion stores. After visiting most of the continents, the list ends with ‘Nowhere’ and ‘Nothing’. Here again, the outcome is arguably a given – we are all aware of the arguments painting disciplines like fashion essentially devoid of any higher meaning, and we are both envious and resentful of their success. But Babsky’s work doesn’t represent the disgruntled camp; instead, it creates objects of immense appeal which self-evidently shouldn’t be appealing. The transparency of the object and its idea comes from within the viewer thus leading him to wonder why we are so readily drawn into ideas we know to be empty. 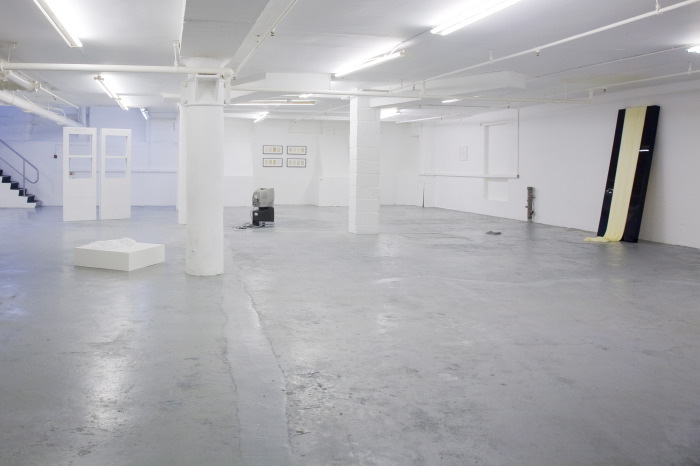 Robert Dunne’s A Diary of Non-Events is an ongoing body of work started in 2006. The Diary examines life’s lowlights – the cycle of disappointments, anti-climaxes and let-downs we experience everyday. Presented as deadpan documentation, the non-events picture missed opportunities and minor mishaps – a diary of a life longing for better endings in novels, more frequent visits of the circus, a better supply of potential partners, and fewer dead telephone calls. This isn’t because the artist’s life is a series of misfortunes, but rather because he recognises possibilities in situations where they are not necessarily obvious. The works lie in the chance, rather than in its non-realisation. A number of works in the series displays an intentionality not present in the organic and ‘observational’ pieces. Sparrow, exhibited here, is probably the most aggressive of Dunne’s works. A fertilised bird’s egg is smashed with a hammer – with no context or reason. The possibility of life is prevented from taking its course – the grandest non-event of all. The act, seemingly sinister, is in fact a reaffirmation, a display of force and an active marker of free will. Last Pages are a game of the spoil-sport. The artist has removed the last pages from a series of library books before re-introducing them into circulation, thus preventing others from enjoying the final moments of love affairs, the resolution of detective stories or morals of the tales. Like many of the works in unfinished business, the books ask the audience – in the gallery and outside – to make up their own ending. We would like to thank the artists, Maxa Zoller, Stein Iversen, Siri Aronsen, Toby Christian, Rachel Withers and Zuzanna Janin. Kevin Schmidt work courtesy Catriona Jeffries Gallery, Vancouver. Stian Ådlandsvik works courtesy Galleri Erik Steen, Oslo. Waterside Project Space is supported by the National Lottery through Arts Council England. We gratefully acknowledge the support of Mr James Ellery and Wonder. The exhibition is generously supported by the Royal Norwegian Embassy London.